I don’t usually do hard news on this blog, but I was contacted this week by The Chicago Convention & Tourism Bureau (CCTB), who asked if I might be interested in taking a look at the following story. 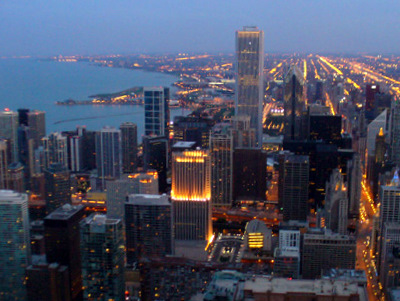 Having been to Chicago a couple of times for events at McCormick it’s good to see this consumer-focused legislation moving into place. Changes were announced this week that “truly changes the landscape here in Chicago,” according to David Causton, McCormick Place General Manager. New legislation that wound its way through the Illinois General Assembly that basically gives the customer (the exhibitors) a new bill of rights. For instance, “The legislation grants exhibitors the ability to do their own electrical work or contract it out, and bring in their own food for personal consumption.” That from the press release issued last Friday, May 7th by the Chicago Convention & Tourism Bureau (CCTB). According to the e-mail I received this week from Maura Cheeks on behalf of the CCTB, the legislation is waiting for Governer Quinn’s signature to become law. He’s expected to do that soon. The CCTB’s official statement in support of the bill. Along with the CCTB website, check Chicago Meeting Matters for background, fact sheets, videos and other information. Wow. Hard news from Tradeshowguy Blog. Whodathunkit? It was 29 years ago today when I was a young DJ in Salem, Oregon. One of my jobs was to ‘rip-n-read’ the news, so I was regularly heading to the news room to see the latest, and include the pertinent stories on the air. On that day, May 11, 1981, the news came over that Bob Marley had died of cancer. He was in Miami, on his way home from alternative treatment in Europe. He didn’t make it alive. As Music Director, my main job was to handle the music playlist for the Top 4o AM station. I was a big Bob Marley fan, but it was hard at that time to justify playing any of his music on the air. No one in the world of TOP 4o knew who he was. Yes, some folks knew he wrote “I Shot the Sheriff” which had been a Number One Hit for Eric Clapton in ’74. And he had written “Stir It Up,” which Johnny Nash tossed up the charts in the mid 70s. But his recordings had a hard time getting a toehold on ‘traditional’ music radio. The one minor exception was “Roots, Rock, Reggae” which made it up to #51 on Billboard’s Top 100 in 1976. And yes, as a Music Director I played it. Mixed it right in with Wings’ ‘Silly Love Songs,’ Wild Cherry’s ‘Play That Funky Music’ and Dorothy Moore’s ‘Misty Blue’ among others. Hell, I thought it fit just fine. But when it faded a few short weeks after debuting, I couldn’t justify keeping it around so I dropped it out of rotation. Except in my living room of course. So how could Bob Marley make an impact on your life? 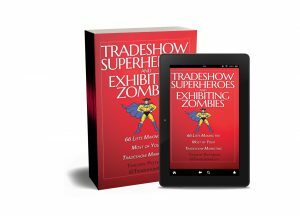 On your tradeshow marketing? Think it’s a stretch? It depends on how you apply it. In reading about Bob’s life, one thing sticks out: his unceasing devotion to his path. He knew from the age of seven that he would be a singer. He never let anything derail him. No doubt there were many chances to choose to do something else, but he never wavered. So that’s one thing: figure out your tradeshow marketing goal – and stick to it. Don’t let anything keep you from your objective. Another piece of Bob’s life I truly appreciated was his dedication to his craft. He gave his audience his best. Always. There are stories of when he was in the recording studio, he’d stay late nights for hours and do take after take on a vocal track to get the right one. When Bob Marley and the Wailers toured, he was always the first off the bus to rehearsal, and the first back on the bus after the show. So: devotion, dedication and takin’ care of business. Good things to keep in mind for any endeavor. “Could You Be Loved” – are your visitors looking for a little love from your business? Treat ’em nice! “Get Up, Stand Up” – stand up for your visitors’ rights! Again, treat ’em nice. “Slave Driver”…ever had one of those bosses? Okay, all in fun…but definitely some inspiration here. Put on some Bob Marley next time you’re doing prep for your upcoming tradeshow – and see if you can get a little inspiration, Jamaica-style. The Sixties were an incredible decade. From the beginning to the end of that ten-year span our worldwide culture grew and expanded at an incredible rate that no one standing at the precipice of 1959 could have foreseen. You can hyperventilate just trying to talk about it. Thousands of books have been written about the Sixties. But this is not a book. I just wanted to set a little context for what the Beatles did with marketing their ‘brand’ in the 60s. Well, maybe not their marketing exactly, but the essence of who they were. It’s what people saw, felt and heard. So in a way they were marketing. 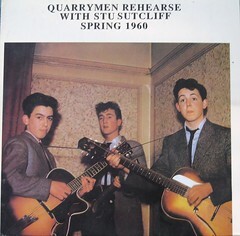 The Beatles came out of working-class Liverpool. There were a lot of other bands out of the Sixties that started in similar circumstances – looking for a way out. Look at The Rolling Stones, The Who, The Yardbirds, the Dave Clark Five, Chad and Jeremy, Peter and Gordon, Freddie and the Dreamers, The Animals, The Zombies, Herman’s Hermits, Manfred Mann and other Sixties bands. On this side of the pond we had Paul Revere and the Raiders, the Beach Boys, Jefferson Airplane, the Byrds, Mitch Ryder and the Detroit Wheels, the Righteous Brothers, The Turtles, Tommy James and the Shondells, the Ventures, The Monkees, The Mamas and the Papas, Lovin’ Spoonful, Simon and Garfunkel and more. 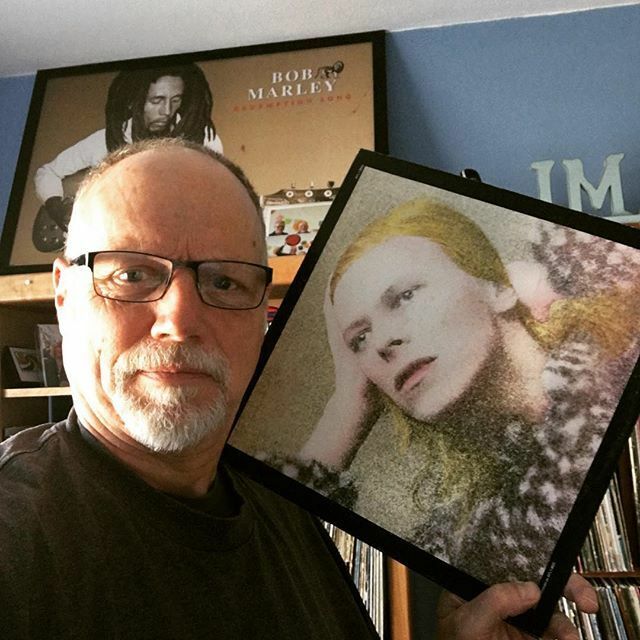 They evolved, changing from mop-top pop teen idols in ’64 and ’65 to experimental psychedelia in ’66 and ’67 that incorporated worldwide influences, to mature radio rock in ’68 and ’69 to a rootsy farewell in 1970. How about the looks they incorporated? Early 60s: skinny ties, identical suits, Beatle Boots, identical mop-top hair cuts that were more than cutting edge. Mid-60s: casual, relaxed mod clothing, individuality…to the psychedelic look of the Sgt. Pepper album. Late 60s: more individuality and variety. Paul moved to more conservative clothes, John let his hair grow (until he shaved his head in the early 70s); Ringo was always dapper; George was the uber-upscale hippie. Few of their contemporary bands can claim that type of evolution in music or looks. Which is probably why they are much more ‘trapped in time’ than the Beatles, who remain timeless in many ways. When you picture Paul Revere and the Raiders you conjure images of those three-cornered hats and the Revolution outfits. Think of the Dave Clark Five and you picture those black ties and coats. And so on. By the time the rest of the rock bands of the mid-60s tried to play-catch up it was too late. They were already pigeon-holed to a time and place. But not the Beatles. They led the way, changing fashion and music by being true themselves, true to their creative spirits and urgings. The ultimate test came in 1970 when, to continue to be true to themselves, they had to disband. They had been together for over ten years. They had changed the world. It was time to move on. As a company or a personal brand, are you being true to yourself? Or are you jumping in the slipstream looking to catch a ride on someone’s coattails and hope that they eventually fade away and leave you standing alone? Matt Selbie of Oberon3 in Portland, Oregon is a recent Oregon transplant. The company’s business-enhancement product The Opiniator is less than a year old. After finding my blog, Matt reached out to introduce himself (great networking) and after a conversation or two I thought I should get him on the blog with a podcast. What is the Opiniator? How can you use it in your business? What can you do with it at tradeshows? Matt addresses all of these questions and more…including the origin of that decidedly non-Oregonian accent. When exhibiting at a tradeshow, you’re there to make sales, brand your business, brand your product, schmooze with industry partners, scout out competitors and okay, do a little partying (perhaps). Are you using the time to do some specific research by using surveys? No? 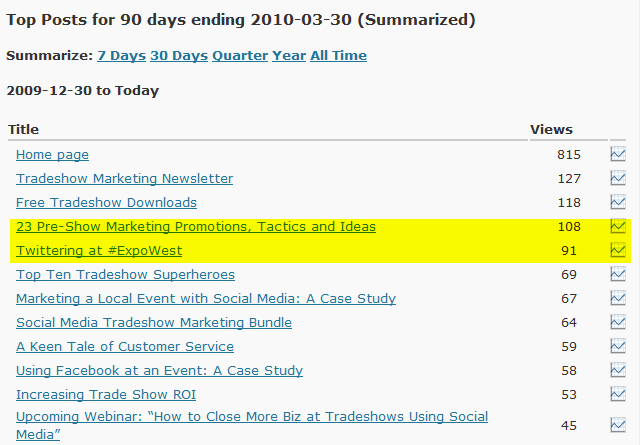 Too bad, it’s a great way to uncover useful information that you may not find elsewhere at ten times the price. Since you’re already there at the tradeshow, you might as well take advantage of the opportunity. Here are seven ways you can use surveys at tradeshows to bring home more than just some sales and the memory of a great after-hours party. 1. Product comparison: put your product up against a top competitor, much like the old cola wars taste-tests. Take the labels off of your brand and a competitor’s (if you dare), and put them up against each other side by side. If the results come back in your favor, issue a press release, tweet it out. 2. Quickie 2 or 3-question survey: easy to put together and easy for your visitors to take 15 seconds to answer. You can hold a clipboard and pencil, and ask visitors if they can spare just 15 seconds to answer three questions. Be specific and don’t go past that time. Ask the questions, and then finish with a “Would you like to learn more about our product?” and if they say yes, direct them to an associate. If they say no, thank them for their valuable time and release ’em back to the wild. 3. More in-depth survey: offer this only to people that have indicated a willingness to learn more about your products or services. If they seem like good prospects, ask if they mind if you can take just three minutes with them. The survey should be handed to them either in the form of a piece of paper on a clipboard or a laptop. Either way, invite them to leave their name and contact information at the end so you can follow up with the more interested folks. 3. “Live” visual feature or product comparison: set up a graphic and interactive exhibit that asks visitors to make a choice between various possible features or products you may be offering in the near future. Tell them that this research is part of the evaluation process your company is doing. Whether you’re showing 2 or 5 or 9 choices, make the graphics easy to understand and the choices easy to make (hopefully!). Have baskets or jars set up so that visitors can drop something (tennis balls, marbles, etc.) into a jar that echoes their sentiment. Over time each jar will slowly fill up with the choices. By doing this you are giving a visual accounting of how the ‘voting’ or surveying is going. 4. Brand effectiveness: depending on your company and brand, you may want to survey your visitors on how they perceive your brand in comparison to your competitors. While this may take a little more thought to set up, the survey can yield some very worthwhile results in how you are perceived in the marketplace. 5. Measure effectiveness of pre-event marketing: if you do extensive pre-event marketing within your industry in trade magazines or other media, you can survey the effectiveness. If you do a lot of social media promotion you can also judge its effectiveness. Set up a survey that asks visitors IF they heard of you, WHERE they heard of you and if the MESSAGE they saw inspired them to visit your booth (or if they just stumbled across it…). 6. Get input for future events: take some time to ask visitors what impacted them the most at the show. The feedback can be used to help craft your booth, marketing, graphics and promotional slant for the following year’s show. 7. Get feedback on a new product: if you have a product that’s been on the market a short time, the survey can be used to get feedback on how that product is perceived, used or consumed by visitors. Take a few moments and ask yourself ‘what can I learn from all of those thousands of tradeshow visitors that will help the company?’ Then come up with a great way to elicit that information via a survey. Feel free to share any ideas you may have in the comment section! 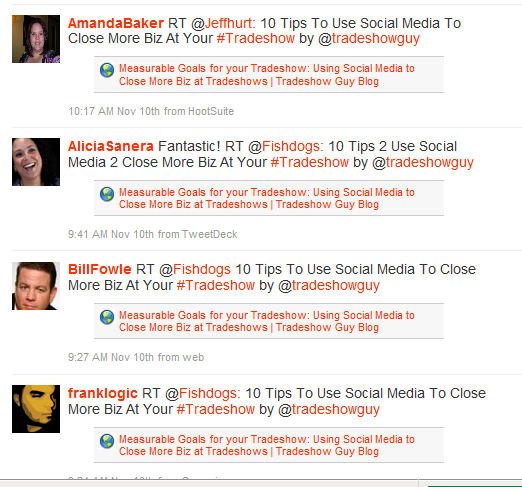 Are You Using Twitter to Drive Traffic to Your Blog and Event? 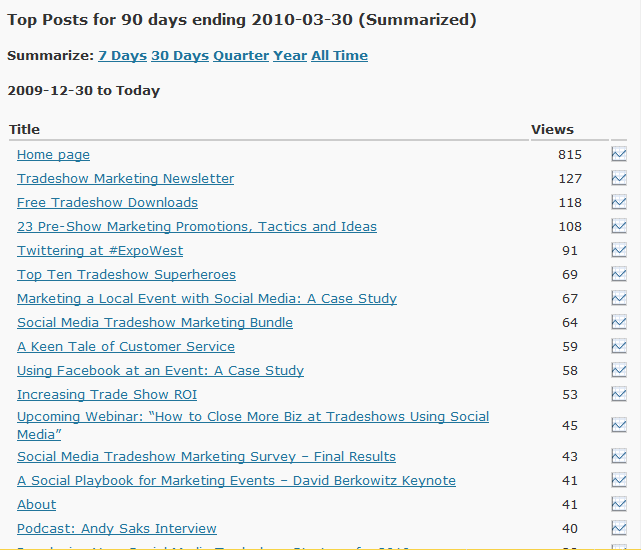 Now that the first quarter of 2010 is officially in the books, I was curious how the viewership on this blog went. And since I can sometimes be a stats geek, I thought I’d post a few numbers. 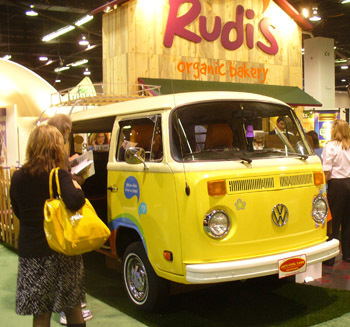 23 Pre-Show Marketing Promotions, Tactics and Ideas and Twittering at #ExpoWest. They were each viewed around 100 times in the past three months. Maybe not much if you’re Google, but for a li’l ol’ niche-oriented B2B blog, I’m pretty happy with those numbers (the three listing above the two most-viewed posts are pages, not posts). 27 Un-Boring Things to do At Your Next Tradeshow and How to Find the Right Tradeshow for Your Company. Both were posted this week and thanks to the Twitterverse re-tweeting them a number of times, the readership climbed quickly. I suspect the ‘list’ approach for the ’27’ post had a lot to do with getting the re-tweets; that the the subject of ‘un-boring’…both of which serve to create interest and draw listeners, both done by design. If you’re a blogger, you should be using these tools to drive traffic. After all, if you write a post, you want people to read it, don’t you? One thing I do is use HootSuite.com so that I can schedule tweets ahead of time; this gives me a chance to post the link 6 – 8 times. Each time it picks up another tweeter who re-tweets it, sending more readers to the post. I think there is a limit to scheduling tweets though, and I’m not sure where to draw the line. I’ve seen people post links and have them scheduled to go out hourly for several days. Yeah, spammy, I know. But with what I feel is a good post I would like to maximize readership. And the great thing about Twitter is that your community will tell you what’s good – what hits their buttons – and what is not. Given that my budget was literally zero – just an investment of time and the ability to use the social media tools – I was more than pleased with the outcome. If I wanted to use traditional media to drive traffic (direct mail, postcards, radio, print, etc.) it would have been a huge undertaking and would have taken months to get everthing set up and implemented. And it would have cost thousands of dollars. With social media all it took was a YouTube and Twitter account, a Facebook page and the ability to create video promos and write posts about it….and the time to make it happen. If you haven’t figured it out yet, I’m sold on social media for its cost-effectiveness and ability to spread useful information to a lot of interested people quickly. And get them to take action. 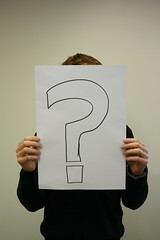 If you’re new to tradeshow marketing, how do you find a tradeshow that’s appropriate for your company? After all, you don’t want to invest a wheelbarrow full of cash and find out that your target market doesn’t come to the show. Not that you’d do that…but you’d be surprised what decisions are made in the world of business based on hearsay or minimal information. Best bet is to ask a lot of questions. Start with your clients. Find out what shows they attend. Then go online and check your competitors. 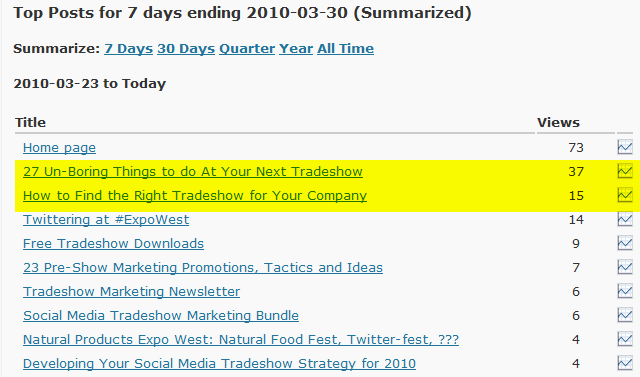 Most businesses these days have an ‘event’ section in their website which usually lists the tradeshows they exhibit at. Also check also with manufacturers and distributors in your industry. Next, search online. 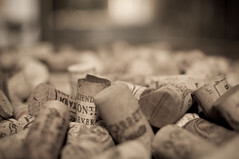 One good resource I have always steered people to is tsnn.com (‘The Ultimate Event Resource). You can search shows by state, country, industry and date. Go to the show’s website and review the information with an eye to determining if this is a show that your target market is likely to attend. Once you’ve compiled a list, target the top 2 – 3 shows and make plans to visit them as an attendee in the coming year. By attending before you invest in exhibiting, you’ll get a good feel for which show(s) make the most sense for you. Besides, attending a show as a guest is a lot cheaper way to find out if it’s the right show than to show up with a booth, your staff and thousands of dollars of product – and wonder why your target market isn’t there. You may have a good grasp about your overall BIG PICTURE tradeshow marketing plan. But what about the DETAILS? Overall execution of your plan at the show may be great, but if you slip on details, someone – a potential customer, perhaps – is bound to notice. Some of the details to track: Is the booth clean and tidy? Are all your marketing materials in synch? Do all the colors match or complement your brand? Are your staffers greeting people with a smile? Do they fill out lead cards with all the information you require? Do the garbage cans get emptied when they start to spill over? Details are important because they help complete the picture. If the carpet hasn’t been attacked with a carpet-sweeper and there are crumbs or bits of paper or junk, people will notice. If your graphics are peeling at the edges, people will notice. If personal belongings are not stowed out of site, people will notice. They’ll also notice if your staffers are talking on a cell phone, eating, drinking or sitting with their arms crossed. 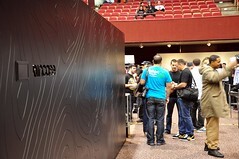 So cross the T’s and dot the I’s – take care of details and the overall perception of your booth will be more positive.